This Lithuanian encampment was located 65 kilometers west of Munich. A product of Team 558 is had its own money with English inscription which read D.P. 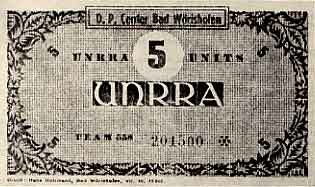 CENTER BAD WÖRISHOFEN / UNRRA and the denomination. 15,000 were printed by Hans Holsmann, July 1946. From Displaced Persons Camp Money by Frank Passic and Steven A. Feller. Here are pictures of Plast members from Bad Worishofen with a listing of all the people on that picture. Last row: Lewko Worobkewycz; NN; NN: ...Mackiw; Zenon Pihut; NN; Zenko Korytko; NN Lubko Korytko; Orest Dumanowskyj. 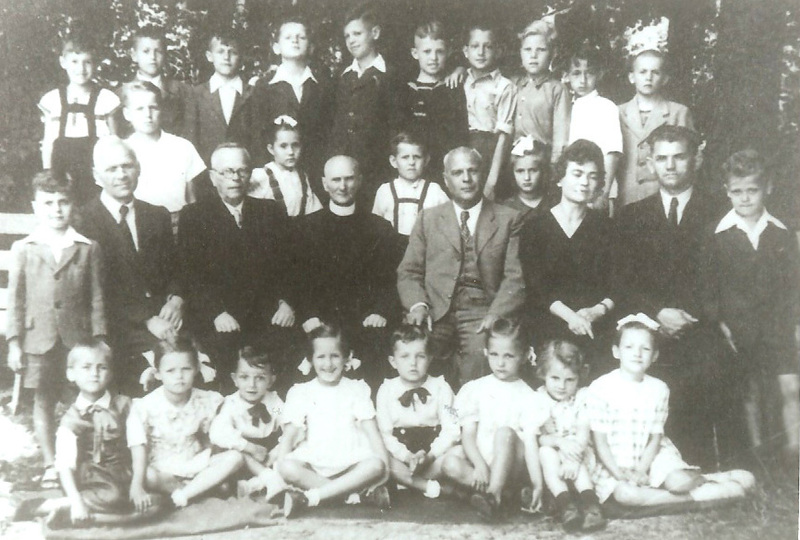 My own family was one of the first Ukrainian families to live In Bad Worishofen from Spring 1946 until our resettlement to Dillingen, Mittenwald or Regensburg mid 1948. To best of my knowledge there were as many as 400+ Ukrainian families in Bad Werishofen. In fact there are quite a few of them still living in Chicago Metro area. I'll try to get as much info from them as possible. Most of them are in their 80' or late 70's. I'm one of the youngest - 69 yrs old. By the way are you familiar with Leonid DENYSENKO and his brother Jurij from Australia? Leonid is a very know artist and graphic down under. Jurij is an architect there also. 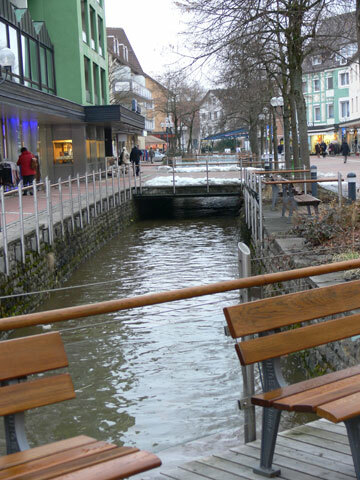 The reason I'm bringing up Leonid is for he also was in Bad Worishofen. He was my late brother's classmate at the only matura class to graduate in Bad Worishofen. As the Google search shows, Leonid tutors a course in cartooning and illustration at Cengage Education in Sydney. He can probably be contacted at that organization through their e-mail facility at their web site at http://www.cengage.edu.au. Leonid is not listed in the Sydney telephone directory. Regards, Inara Bush, Victoria Australia. 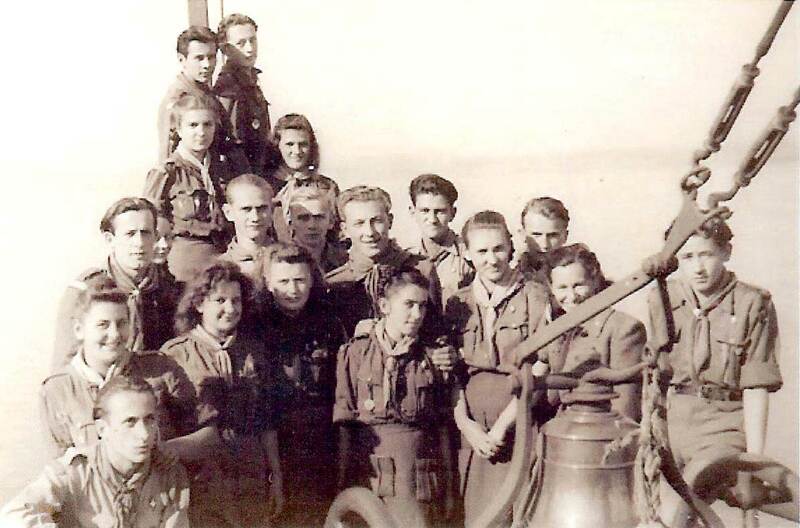 Below is a picture of the graduating class of The Ukrainian Gymnazium (High-School) in Bad Werishofen D. P. Camp - class of 1948. 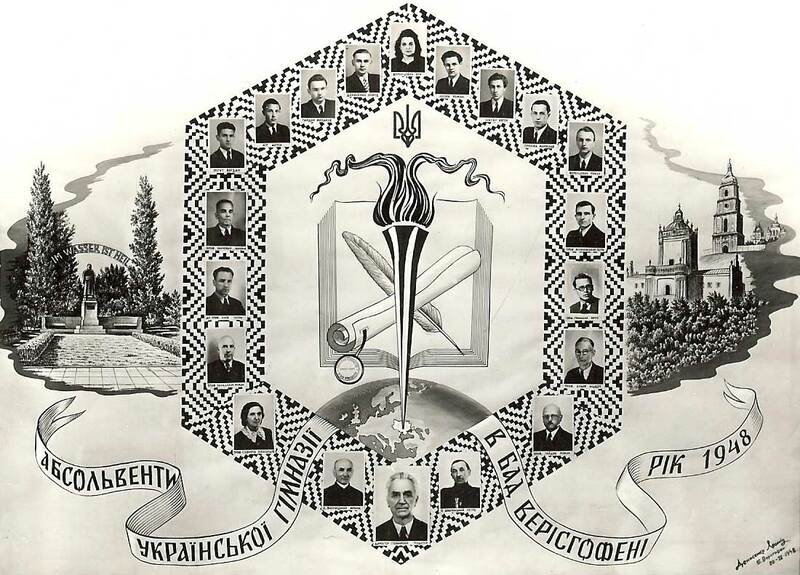 This art work of the students and their teachers was done by one of the graduates - Leonid Denysenko on 20th April 1948. Leonid; FERENCEWYCH, Olya; LESIUK, Roman; SHKLIAR, Evhen; PRYJMA, Myroslaw; FERENCEWYCH, Roman. ZAVADOVYCH, Roman; STAWNYCHYJ, Oleksandra; Rev. WYNNYCKYJ, Mykola; STAWNYCHYJ, Teodozij; Rev. 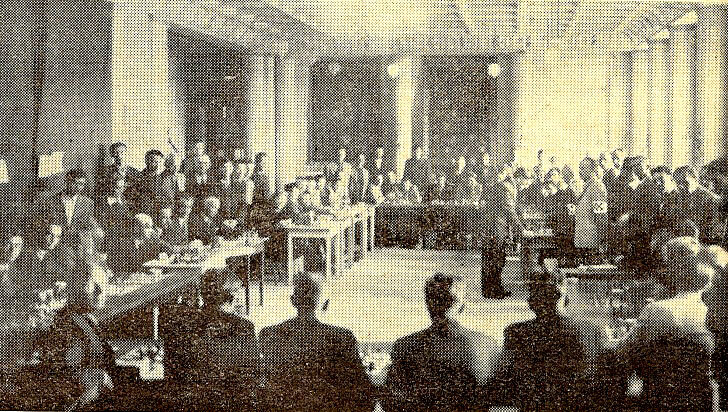 DOBRIANSKYJ, Petro; HAJDUK, Roman; KLOR, Albert; HRYNYSHYN, Evhen; MILIANOWSKYJ, Petro. On the right side are depicted St. Sofia Cathedral in Kyiv and St. George Cathedral in Lviv. 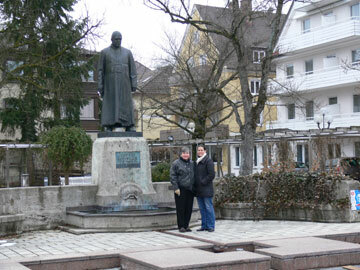 On left side - Monument to Dominican Priest Sebastian Knap - founder of the various health spas for which Bad Worishofen is known for. 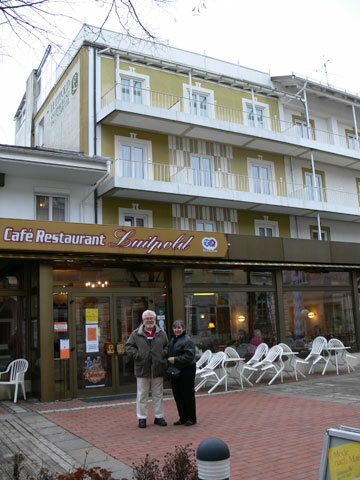 In Bad Worishofen - besides Park Hotel, Waldheim Hotel and Luitpold Hotel some Ukrainians lived also in Luers Hotel. All together there were 491 Ukrainian living in BD. Each hotel had its own administration. In Park hotel Petro Bilaniuk was the administrator for quite a while. He was the father of recently deceased (in March 2009) Oleksa Bilaniuk Ph.D. - well known theologian. Apolinarij Tremboweckyj was the administrator of Luitpold Hotel. All the camps in Bad Worishofen were liquidated in May 1948 due to consolidation of the various camps by IRO (International Relief Organization.) All of the Ukrainians were transferred to other Ukrainian DP Camp - namely to Mittenwald, Augsburg and like our family to Dillingen. In total the Ukrainian DP Camp in Dillingen had 1,656 (one thousand and six hundred and fifty six) residents. Chess Club -Click to enlarge. 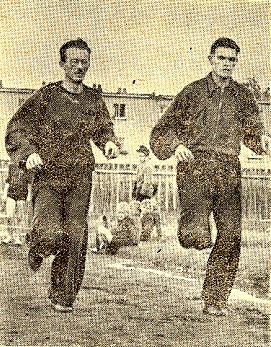 Taras Czmola training in Bad Werishofen -1947. Almanac of the Ukrainian Council for Physical Culture – in Ukrainian language. Munchen – 1951. Published by Molode Zhyttia, page 81. The Ukrainian Sports Club Sokil, in a small resort health town of Bad Werishofen, was founded by a Dominican monk Sabastian Knaip and later organized by Dr. Jurij Stefaniwskyj on 19 November 1946. 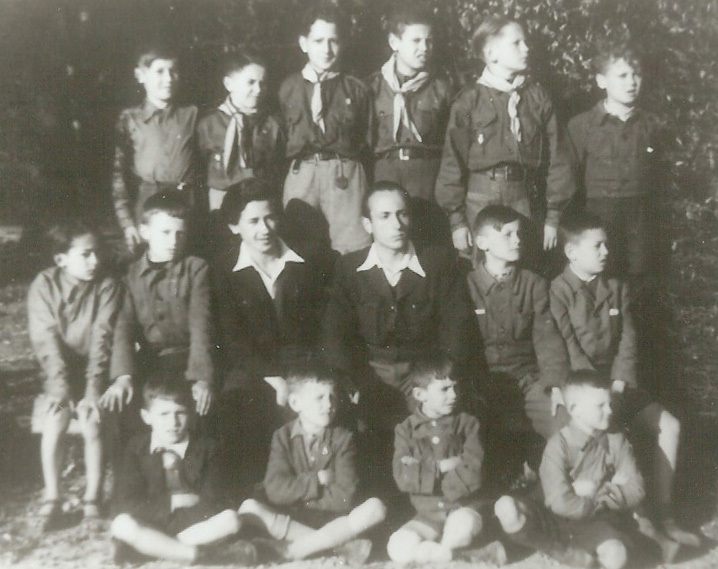 Although the Camp was very small, thanks to the participation and assistance of Luka Lisewych, Mykyta Lozowyj, Iryna Stefaniwska, Josafat Klish and Taras Czmola, the club became very active by July 1948. In this club they had football (soccer), women’s and men’s volleyball, basketball, track & field, chess, skiing, swimming, table tennis and tennis teams. Also, this was the only Ukrainian DP Camp club that had a tennis team which competed in tournaments against German and other DP nationalities. The founding club manager was Lisewych. The club’s best players were Stepan Ben’, Marian Borys, Petro Koshchuk and Lisewych himself. The rest of the teams participated in various provincial as well as in zonal tournaments. The men’s volleyball team took first place (1946) in the provincial zonal tournament (1946) and second place in the zonal tournament (23 June 1946). The club’s basketball team took first place in the provincial tournament and Taras Czmola took first place in the 5,000 k. race in the zonal competition in 1946. This Ukrainian Sports Club successfully sponsored and very competently prepared the first zonal chess team tournament in 1946. Nine various teams participated in this tournament. Wasyl Shklar became the second manager of the club from 1946 - 1947. Others were – Marian Borys from 1947 - 1948 and Jaroslaw Kryshtalowych during the remainder of 1948. There were in total 151 active members in the Club out of the total Camp population of 460. After the liquidation of this DP camp in the late summer of 1948, some of the club members remained in town and participated in existing local German clubs.